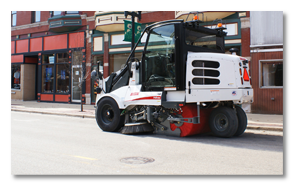 Elgin produces mechanical broom street sweepers that range from 3-wheel to 4-wheel street sweepers. 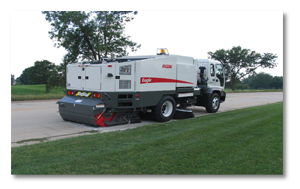 Elgin Sweeper Company has been the leading producer of street sweepers for nearly 100 years. 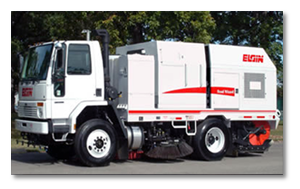 Haaker Equipment Company provides full-size Elgin street sweepers for sale in either single or dual-engine models. We offer California and Nevada customers all models from Elgin from the classic three-wheel Pelican, to the Eagle, Broom Bear and Road Wizard. Haaker Equipment Company is proud to be one of the leading Elgin mechanical broom street sweeper dealers in the country that services California and Nevada by offering new equipment sales, parts and service. 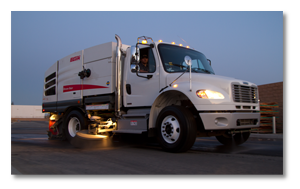 We also offer used, re-manufactured and rental Elgin street sweepers throughout the United States. The Broom Bear is one of the most rugged and efficient mechanical street sweepers for sale on the market today. Whether your sweeping needs are in heavy construction debris or light street maintenance, the Broom Bear can handle it all. Its intelligent design gives you greater water and hopper capacity, requiring you to make fewer scheduled stops. Sweeper operators will enjoy the cleaner dumping action made possible by the Broom Bear’s variable dumping height and eleven inches of hopper side-shift capability. Placed on a commercial chassis with fully dualized controls and a single engine design, the Broom Bear is easy to operate – even transporting at highway speeds – and easy to maintain, giving you the flexibility and quality needed for maximum uptime and profitability. Looking for a four-wheel mechanical (broom) street sweeper with exceptional performance? Look right to the Elgin Eagle. The Eagle combines the proven Elgin sweep system, with variable high dump capabilities and highway transport speeds for maximum productivity. The Eagle is now available with two optional alternative fuel systems, Compressed Natural Gas (CNG) and Liquified Petroleum Gas (LPG), and a waterless dust control option. It has also passed the rigorous Rule 1186, PM10 Certification. Built on a commercial chassis, the Eagle features a dual mode air suspension system, so an operator can go from a solid rear axle for sweeping and dumping stability to a fully sprung chassis for operator comfort and control during high speed transport. Purchasing a three-wheel broom street sweeper? Consider the enduring qualities of the Elgin Pelican. The Pelican offers legendary performance, maneuverability, economy, reliability and serviceability. Mechanical sweepers remove debris by sweeping it onto a conveyor system which transports the material into a debris hopper. Thousands of Pelicans are sweeping around the globe in a wide variety of applications. The reason? Only the Pelican is based on a design that’s been continually improved since 1914. From the large bubble windows and 360 degree visibility to the powerful hydraulically driven side and main brooms, from the No-Jam Conveyor, to the patented sprung guide wheel, ongoing innovation has made the Pelican the world’s most popular three wheel broom sweeper. The Elgin Road Wizard mechanical broom street sweeper has a powerful, dual-engine design with a 360 gallon water reservoir for excellent dust control. It is ideally suited for heavy construction clean up and gravel loading sweeper operations. The control console is located between the operator stations, and all sweep function switches have tactile-feel surfaces that allow operators to work the panel while keeping their eyes forward on the job for added safety and efficiency. The Road Wizard from Haaker Equipment Company has a very large auxiliary engine and huge hopper, which allows this street sweeper to power through any sweeping application you may have. To learn more about all equipment and products we offer, please do not hesitate to send us a message by visiting our Contact page and filling out the corresponding form. Haaker Equipment Company proudly serves areas within California and Nevada, as well as the city of Phoenix, Arizona.